Northeast of Kitale at Saiwa Swamp, Kenya, April 2011. These large predatory ants use their sting for defense and for subduing prey. Most species are shiny black, with an overall cylindrical body shape, and a constricted abdomen. The ants are a huge family of insects with tens of thousands of species. They are an ancient group of hymenoptera related to wasps and bees. 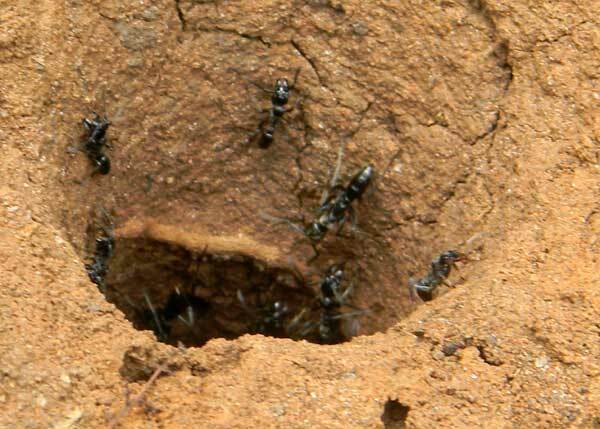 The ants shown here belong to the subfamily Ponerinae. The genus Pachycondyla includes species distributed through the tropical areas. Many of the species in the genus are only distantly related, but with a similasr appearance. 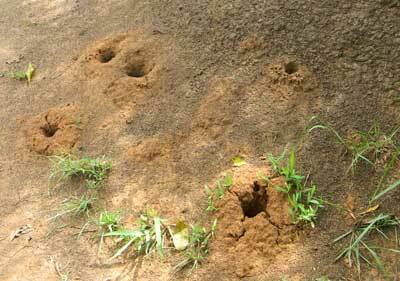 The nest of this species found at Saiwa Swamp had very large diameter nest holes (possibly for carting in large prey? ).